Total metal jacket bullets, often referred to as "TMJ," are one of the most widely used bullet types at indoor ranges and among competitive shooters. The reason for this is simple, but important: The normal full metal jacket (or FMJ bullet) has a small amount of exposed lead at the base, while the TMJ instead surrounds the exposed lead area with copper. Using TMJ bullets, along with other steps to minimize lead exposure, can make you a healthier shooter. Technically, a total metal jacket is a full metal jacket, so confusion is common among people new to shooting or hunting. In many situations these terms are interchangeable, and a quick glance at a cartridge will tell you if lead is exposed (the FMJ will have visible lead at the base of the bullet, while the TMJ will not). Both types of ammunition are almost identical when it comes to accuracy and velocity. The TMJ round is suitable for target shooting, as is the FMJ. But when it comes to hunting, the TMJ is not always the best choice, as it won't expand as well as other bullets like the hollow point. However, for hunting large game that requires deep penetration, the TMJ (like the FMJ) could be the best choice. In an environment where thousands of rounds are fired rapidly among multiple shooters, all the lead particles floating around create an undesirable amount of potentially harmful air pollution. Over time, this lead accumulates on the ground, so it's easy to see the potential for adverse lead problems in an indoor range. Outdoors, the air disperses the particles enough that it’s rarely an issue. 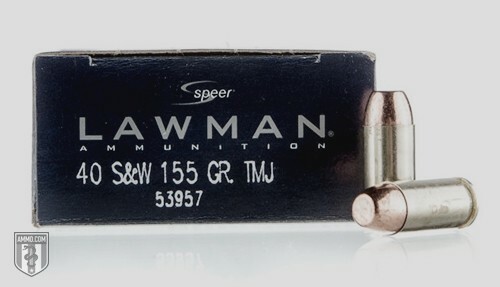 Some indoor ranges go a step further and only carry particular types of TMJ ammunition – such as the Speer Lawman and Blazer by CCI. This, along with lead abatement systems in indoor ranges, make shooting indoors cleaner and safer. If you have genuine lead concerns or shoot indoors regularly, the TMJ is the better option. Cases of health issues arising from FMJ ammunition are rare, so keep in mind there is a debate about how much FMJ use is harmful. Is lead safety the primary reason TMJ rounds are used? The short answer is yes, depending on sites you visit or ranges you use. Everyone will have their own (often very strong) opinion about it, which is why many ranges are specific about acceptable bullets and casings. If you shoot rarely or only during hunting season, there’s no real need to select a lead-free cartridge – because you aren’t expelling enough for it to matter. Use your personal preference when selecting your ammo type, and if you decide to hit the range hard, consider TMJ rounds if your range allows.